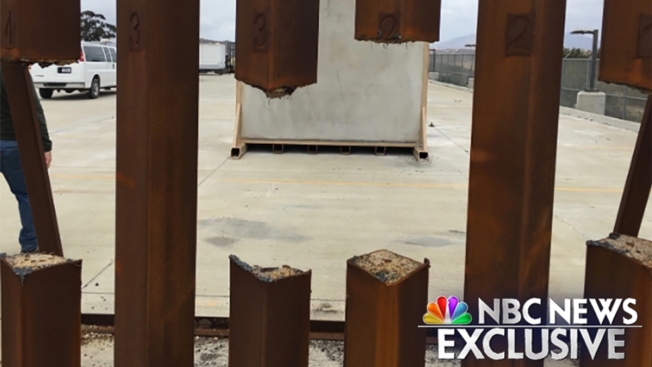 A test of a steel prototype for the proposed border wall showed it could be sawed through. President Donald Trump has repeatedly advocated for a steel slat design for his border wall. But Department of Homeland Security testing of a steel slat prototype proved it could be cut through with a saw, according to a government report. A photo exclusively obtained by NBC News shows the results of the test after experts from the Marine Corps were instructed to attempt to destroy the barriers with common tools. Testing by DHS in late 2017 showed all eight prototypes, including the steel slats, were vulnerable to breaching, according to an internal February 2018 U.S. Customs and Border Protection report. Photos of the breaches were not included in a redacted version of the CBP report, which was first obtained in a Freedom of Information Act request by San Diego public radio station KPBS. DHS did not respond to NBC News' request for comment. A department representative had told KPBS that the prototypes "were not and cannot be designed to be indestructible."